Grants Griffon a colorful parrot color scheme. Important note: This is an early alpha version so things will change with the next version. I just thought: "Why not share it with the community?" Extract the mod manager and place it anywhere you like. Before using the mod manager for the first time, right-click the game in Steam and choose properties-> local files -> "verify integrity of game files"
Copy the .rar archive inside "[modmanager]\Games\DMC5\Mods". 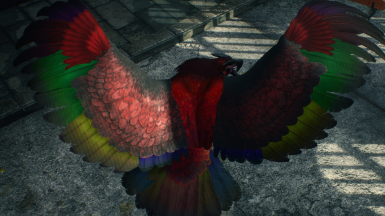 Start mod manager and install the DMC5 Griffon Parrot mod via the menu.